3/05/2011 - I love me a Sun Droplet. Problem is, there's only ever been two, and that's being generous. 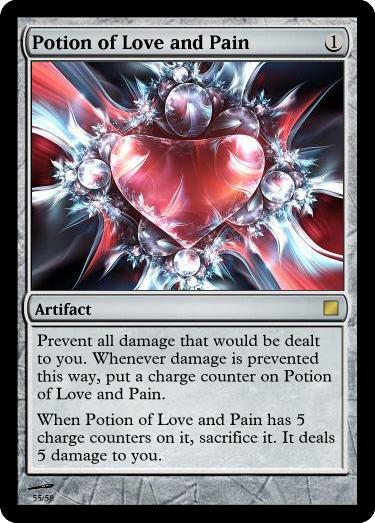 Potion of Love and Pain follows my recent rash of art-inspired cards by offering a new twist on artifacts that make it harder for your opponent to kill you. I decided to give this one a darker bent by making it all good up to a sizeable but very real threshold and then making it explode in your face. 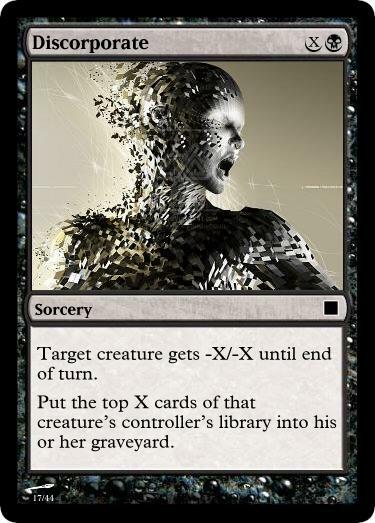 Kind of lich-esque, in a way. Any time you're creating a counter condition, whether it's in programming or on a card like this, you want to think about whether to use == or >=. By choosing not to say "When ~ has 5 or more counters on it..." I've created a subtle loophole that would give a player clever enough to put multiple counters on it at once permanent damage prevention. If I'm right about the rules, being dealt damage by two creatures in combat when you have four counters on Potion of Love and Pain would also allow you to circumvent the sacrifice clause. 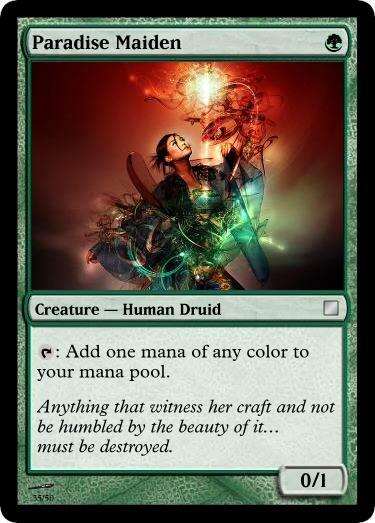 Even if the first situation were acceptable, the second clearly is not, so this card definitely needs "or more" added to it. I don't have much else to say about this other than, "Hey, look! 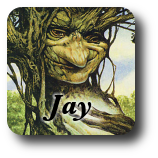 Another of a very small list of 1cc cards that are often better cast in the mid- to late-game."